Sir AFK, OFF, Duke of Gwynedd and 2 others like this. _hitsuji418 and Daikonradish like this. It's not a problem, I read your information box and you seem to be a very nice person! I am Mexican, and my native language is Spanish (Latin, Castillan is very different). I am not someone who speaks English very easily, if you want to contact me for some reason you can do it speaking in English, but I will respond to you with the help of a translator In case something is badly worded or maybe I said some offense, I'm sorry. Ademas de dedicar mucho a jugar Terraria también me dedico a construir dentro del juego . Comparto mis creaciones en mi Artwork de Steam, al entrar en mi perfil podrás ver mi expositor de trabajos. 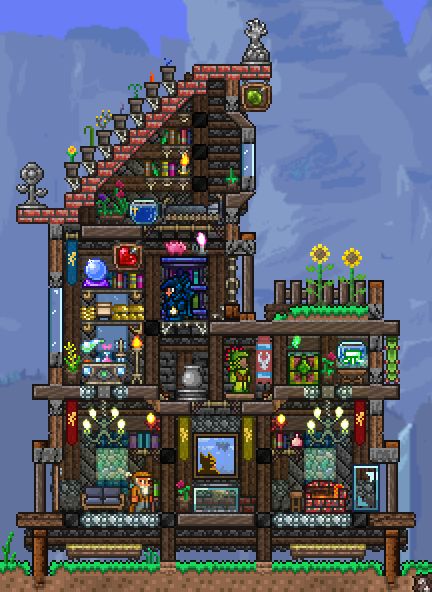 Besides dedicating a lot to playing Terraria I also dedicate myself to building within the game. I share my creations in my Steam Artwork, when you enter my profile you can see my work exhibitor. Me ayudarías mucho si das un voto positivo a mis trabajos. You would help me a lot if you give a positive vote to my work.